Here are some pics of my belly. Sorry they aren't too good. The doctor didn't even bother measuring me last week, I'm beyond what a single pregnancy at 40 weeks measures. I feel much bigger than I look! I see the doctor every week now, I am beginning to dilate (not much though). 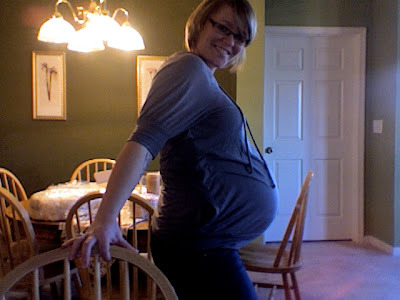 The doctor says he will be happy if we can deliver after 34, that's just over a week away. Please keep us in your prayers, that the decision to go natural or c-section will be very clear. We saw the Seinfeld episode with the man hands the other night, we laughed, take a look at that hand resting on the chair! They are pretty ugly! My feet are the same way and when i wake up in the morning i look like i have had lip injections! Hmm, I'll guess March 27...Dru's bday :). If I'm right I guess you'll have to name one of them "Dru". 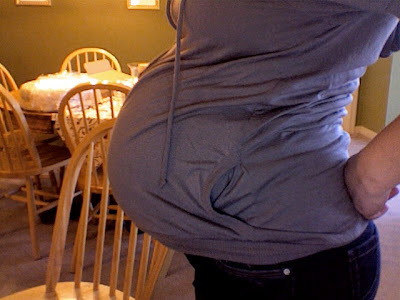 Your belly looks so big to me but you still are tiny everywhere else...just looks like a (huge) basketball belly. Is that bad? People say it's bad to tell prego ladies they look big in any way. BUt I don't get that. I liked when I was told my belly looked big. Hello? I had a baby in there! :) So I mean "big" it the most affirming, happy-you-a-2-baby-momma way! Keeping you in the prayers! I totally had swollen everything! One of my coworkers told me "Oh, it looks like you had botox in your lips." Thanks? Your due in March now? I thought is was in early May! your so cute Katie. you really look great! i have a gift coming for those little guys...my guess is March 20th, the first day of spring. i've been praying for you. love you momma. I bet on March 18th, you'll feel differently, and wish they would be born on like, March 17th. 19th! Love ALL of you! Wow. You look so stinkin' cute. I'm guessing April 15th. How's that? Bet no one is betting on that, eh?